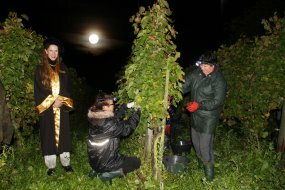 The VDP premium winery VON HÖVEL harvested the first Feng Shui Riesling full moon wine in the full moon night 08. to 09. October 2014 in the premium single vineyard „Oberemmeler Hütte“. Max von Kunow, owner of the winery von Hövel: „As estate owner and hunter I observe for many years the nature. Particularly the full moon fascinates me.In 2013, in a full moon night we prepared and started carefully this project with Feng Shui Master Gabriele Podzun, who studied intensively the full moon calendar and the effects on plants. In the full moon night 08. October 2014 we harvested in the famous premium single vineyard „Oberemmeler Hütte“, ripe and healthy grapes for this worldwide rarity. Hans-Jürgen Podzun, winexpert and long-standing president of the german wine- and sommelierschool, independent winejournalist supports the project:“ Naturally it depends on many factors like: terroir, weather conditions, the owner and winemaker´s experience …Obviously, it`s not possible to harvest a full moon wine every year ( for example 2013). Most important is the quality in the glass. 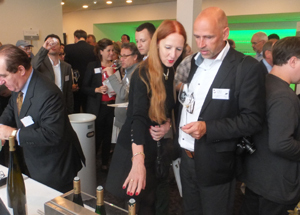 But such rarity will attract great attention and opens a door for the german Riesling, especially from Mosel and Saar“. In September 2014 Feng Shui Master Yap Boh Chu from the Great Master lineage Yap Cheng Hai from Malaysia visited the Saar , the winery and the vineyard for the full moon wine. 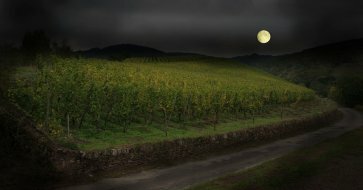 The full moon wine was offered exclusively at the VDP auction on autumn 2015 at Trier.